I’m so happy to present you with Ollie Loop’s FIRST crochet pattern!! I had a customer request some bunnies and was not able to find a pattern that worked up quite like I wanted. I decided to try to work on my own design and I was able to create these adorable bunnies!! I’m excited to share this FREE pattern with all my crochet friends! The bunnies are made up quick with minimal, to no weaving in ends. Yes, you read that correct. These bunnies are not only super easy and quick to create, but they’re STRESS FREE too!! I call that a win/win! For these bunnies I used Red Heart Super Saver for all except the green which is Lion Brand Vanna’s Choice, but you are welcome to use any worsted weight yarn to work up your bunnies! Lion Brand Vanna’s Choice – This one was a leftover in my stash and I’m not 100% on the name. Red Heart Super Saver in Spring Green comes close to the shade. About 6 inches in height from bottom to tip of ears. Yours might be slightly smaller or larger depending on your tension. Feel free to play around to create the size you’d like! We begin at the bottom of the bunny. Start with a magic ring. Start stuffing the body. Next we start to work the next part which is the bunnies head. Start stuffing the bunnies head and then begin on first ear. You may want to add bunnies face at this point also. I embroidered french knots for a nose and eyes. But feel free to use a technique you are comfortable with or use small beads or shank eyes. Now this part might be tricky for some, but it’s all part of the ‘Stress Free No Weaving’ I promised you! 😉 Instead of working a slip stitch to end this round, we’re going to use a sc. This will help close the gap between the bunnies ears and you won’t need to weave to close. Make sure to skip this stitch in the next round! It’s not counted as a stitch but instead as a slip stitch. You can instead skip this step and use your beginning string for the next ear to weave the hole closed. Next we will begin the other ear. Connect yarn to unworked stitch and sc around the unworked stitches. 6 total. Repeat with connecting last stitch made to first stitch made with a sc. Continue with the pattern for the first ear for the second ear. Weave ends into body for a ‘Stress Free’ project!! How cute!? I love seeing all the bright colors lined up! I hope you enjoyed this pattern and if you have any questions feel free to contact me! I’m excited to see photos all the bunnies everyone makes! Share them on Instagram and Facebook with the hashtag #ollieloopsspringbunnies to make sure to be seen! Get Those Toys Off the Floor! “Get those toys off the floor!” I could hear my voice echoing through my head. I’ve said this too many times before. Nerf darts, matchbox cars and stuffed animals were spread out as far as the eye can see. “But I don’t know where to put all my darts.” My son whines. “Put them in the bucket over there in the corner. Then grab your storage container for your cars.” I tell him. “Hmmm. Good question. You need something to store all your stuffies.” As I look around the room I think back to those toy hammocks that you find in stores. The problem was my son only had about 20 stuffed animals and not 100. He didn’t need something that large taking over his room. I did some research on Google and Pinterest to see what I could find. After a few minutes I found a photo of this super adorable nursery. And in the corner were two toy hammocks stacked above one another, but they were each small enough to hold a small amount of stuffed animals. This was exactly what he needed! I grabbed my yarn & hook and got to work. Within 30 minutes I had this made and hung for my son. He helped as we gathered his stuffies and stacked them neatly in the hammock one at a time. Of course, I had to make one for my daughter as well. She’s older but still has a small amount of stuffed animals that she has held onto over the years. I wanted it to be not only a storage feature but also a decorative one. I had been looking through a Pottery Barn catalog early that day and remembered the fringed wall hangings I saw and inspiration struck me! Again I sat down and within a half hour I had a fringed toy hammock created for my daughter! Since then I came up with a few ideas for color schemes and one of my favorites is the Mermaid Fringe. The fringe is made up in pastels shades that match the beautiful mermaids of the sea. Gorgeous, am I right!? I feel as though this matches every little girls room. I now have these toy hammocks listed in my Etsy shop and I hope they can help you like they did my children and I. Many color options are available including larger sizes for those of you that have more stuffies! Custom requests are available just send me a message before checking out! Also be sure to check out the listing for the Mermaid Fringe Hammock. I have other options for sizing on those as well! These nets are made in a variety of sizes, so you’ll have no issue finding just what you need. These are perfect for either a nursery or a child’s bedroom. Can also be used in laundry room or bathroom to hold towels, paper products or anything you’d like! Each net has three loops on each end for easy hanging. I recommend using eyelet hooks or Command Strip Hooks to hang. These will stretch over time and with use. PLEASE these are not for babies or children to sit or relax in. These Toy Hammocks are also Machine Washable. Lay flat to dry. Shop for your own Toy Hammock by clicking this link now! It’s a Must Have Item for your baby! The Fresh Food Feeder from Munchkin is one of my all time favorite things for my children when they were just starting solid foods. They loved being able to eat the same foods as Mommy and Daddy, but not at the risk of choking. It’s all about the independence. So easy to use, just simply add in some chopped up vegetables, fruit or even meat and snap shut. The handle is thick and easy to grip. Perfect for those little hands. Easy to use. Easy to Clean! Just use soapy hot water. There is no way you’ll only own one. Toss one in the car for on the go trips, or the diaper bag for those trips to the Grandparents house. They also come in three different colors! Have a fussy baby? Or are they teething? Try tossing in some frozen bananas or even use formula or breast-milk to make milk pops. A real treat for sure! Some Ideas for the Fresh Food Feeder: bananas, frozen grapes, ice chips (or make milk pops! ), avocado, frozen melon, frozen yogurt, carrots, squash, turkey, chicken and more. You can find these at most stores like Target or Walmart, online at their website Munchkin, or even on Amazon! For sure this is a MUST HAVE baby item. Welcome 2019! With the New Year upon us, I’d like to take a moment to introduce myself! Hello! My name is Mandey and I’m the owner of Ollie Loops. My business name started from a personal nickname, Olive Oyl (thin & tall with long hair always up in a bun). Mostly I was called Ollie and it stuck with me when it came time to decide a name for my shop. I’ve been married to my best friend for over 13 years. We met right before my 16th birthday. It was love from the start. I can’t imagine my life without him. I’m a proud Mom of two kiddos. A daughter and son. Both are so smart and such funny kids. I see so much of myself in my daughter, and she looks exactly like me. My son in truly like his Momma. He has such a big heart and such a wit about him. Coffee is my drink of choice. Even if it’s 95+ degrees outside. My neighbor gave me some houseplants a couple of years ago and I was able to keep them alive so I figured I’d add a few more to my collection. I now have over 50 houseplants. Just a slight addiction I know. I have two American Bulldogs, Brinx and Snoopy. A cat named Lola. And 3 fish-tanks filled with all varieties of fish. Yes, THREE. I’ve lived in Maine my whole life. I can’t imagine myself anywhere else The seasons in Maine are gorgeous and make living here (despite the winter) worth it. I love my home. I do however, hate the cold. HATE. It’s a strong word I know and I’m not using it lightly. What about you? Anything we have in common? Feel free to introduce yourself or just say hi! 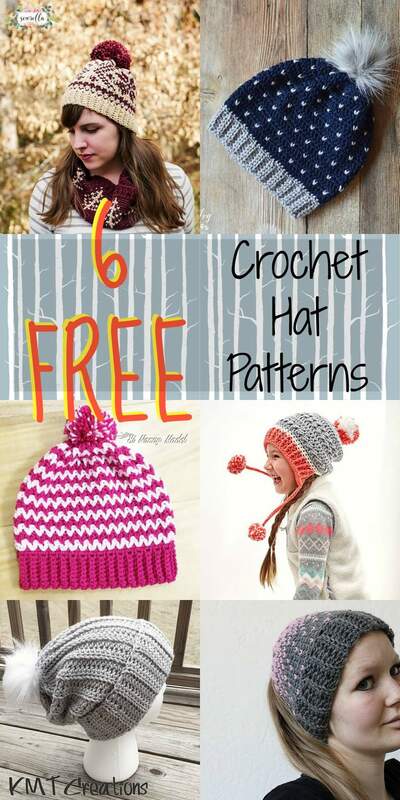 Top 6 Free Crochet Hat Patterns! Living in the Northeast we sure get a lot of cold weather! Wearing a hat is a must during that season, and having something unique and handmade is perfect! Each of these hats are adult size and a couple can be made in sizes smaller to fit. 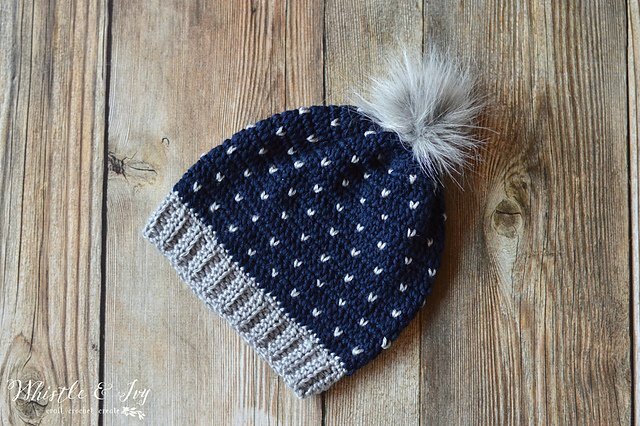 Check out my Top 6 FREE hat patterns right now! 1. 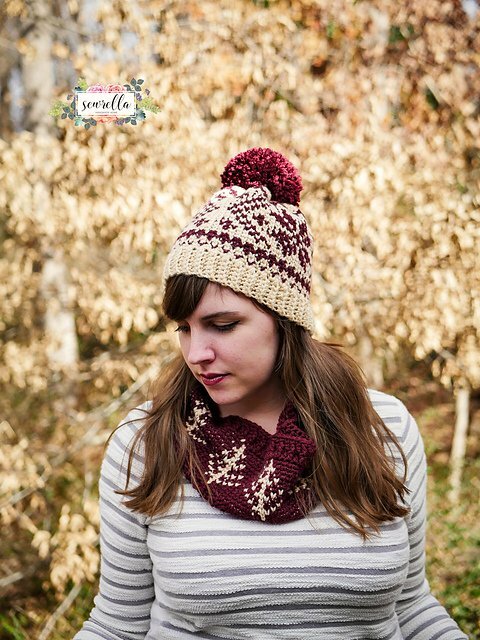 Sewrella has some amazing free patterns and I’m really loving her Faux Knit Fair Isle Toque and Cowl! Isn’t it gorgeous!? 2. Next up is Whistle & Ivy! I’ve created a few of her patterns. A cover for my tablet, cute shoes for my baby niece and also a pair of mittens with this same stitch as the hat! 3. 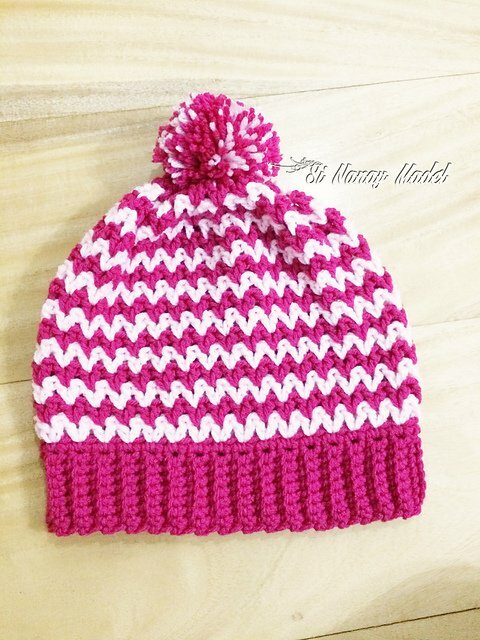 Loving this awesome zigzag hat I found on Raverly. The designer, Si Nanay Madel created something really cute using the ‘ V’ Stitch! 4. 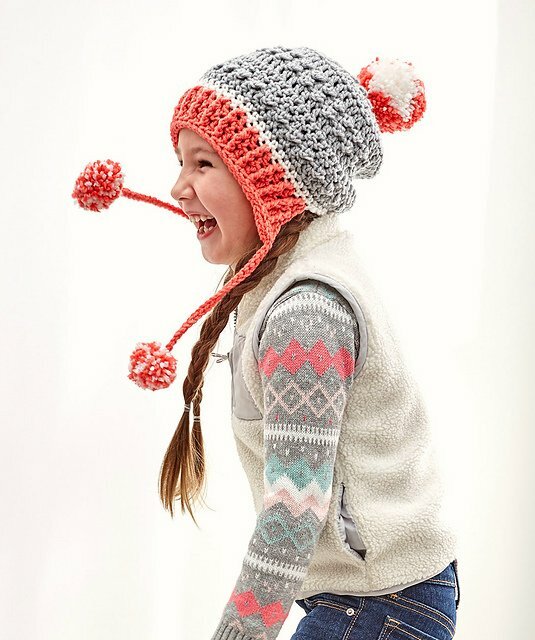 This super cute hat comes in a few sizes so matching Mommy & Me hats would be great! Really loving the pom-poms, especially the one on top! See the star!?! LOVE!! Creater Maria Bittner did amazing with this one! 5. This hat is another Raverly find. I love how quick this hat can be made. And the extra length folded up for the brim is perfect. Wear as a beanie or slouch! 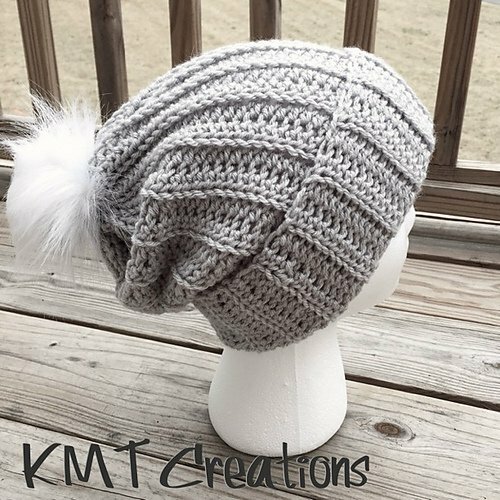 Check out KMT CREATIONS for more free hat patterns. 6. Lastly, is a hat I’m excited to make next. 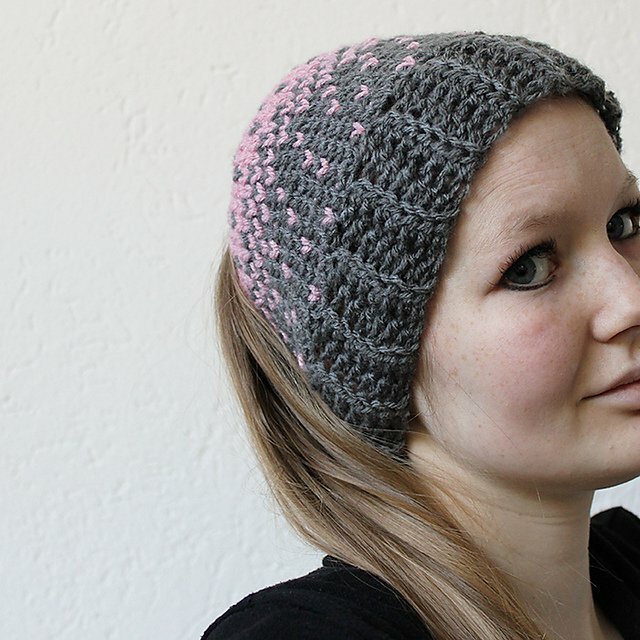 Using the same stitch as hat pattern #2 ….The look creates a look of falling hearts! And for those messy bun hat lovers, be sure to check out Made by Wilma’s other version of this hat! Be sure to check out my Facebook page Ollie Loops or follow me on Instagram at Ollie Loops!! Valentine’s Day will be here before we know it and I always love to decorate my home in pretty things. Especially if they’re homemade! Being a very crafty person, I enjoy keeping my hands moving. 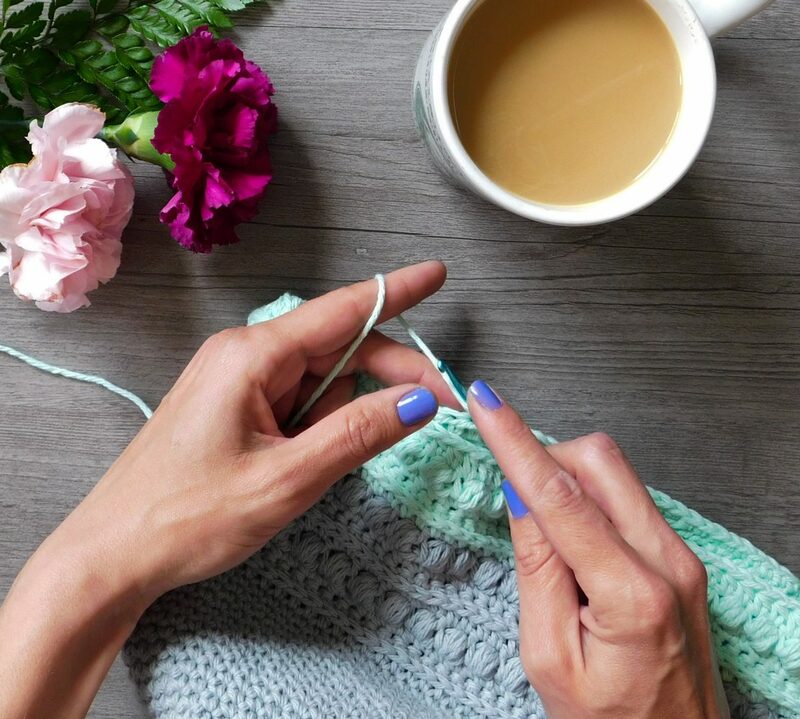 Should I have my fingers twisted in yarn or my hands on a glue gun…I like to stay busy! 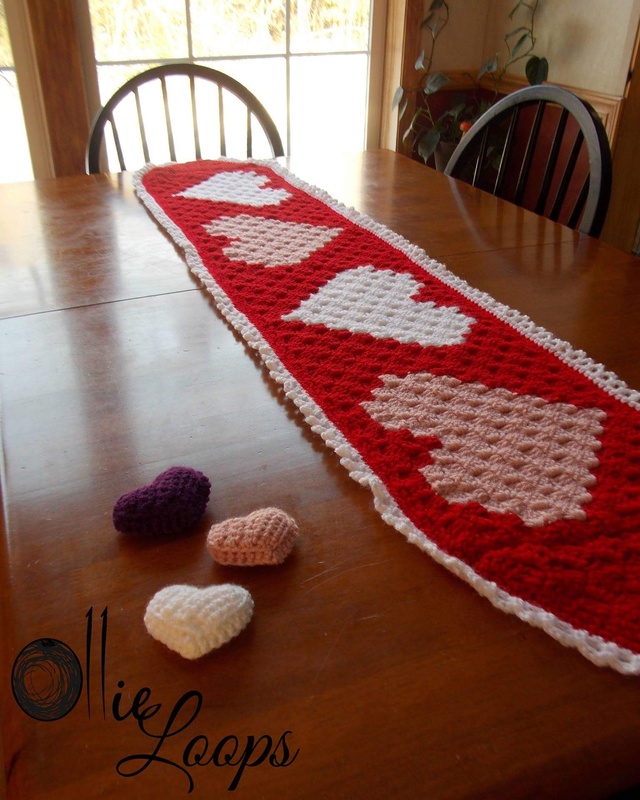 I found this awesome free pattern for a table runner that’s in the traditional Valentine’s colors, red white and pink. 4 large hearts ran down the center and the runner was complete with a pretty edging. I completed mine in three days time with having to frog 20 rows after spying a mistake! I couldn’t let it go..But wasn’t too bad to fix. I really enjoy these C2C patterns but some times can be tricky! Thanks for another amazing design Repeat Crafter Me! You never cease to amaze me! Oh, and the small stuffed hearts shown in the photo are also a pattern from Repeat Crafter Me!! I used Lion Brand Vanna’s Choice to make up these three mini ones! I’m thinking of glueing them to a hair clip for all the little girlies I have around here! Wouldn’t that be pretty! !